Ethical and Attitudinal Reorientation Commission, EARCOM, has began mass sensitization campaign on the 2019 elections and other social vices. 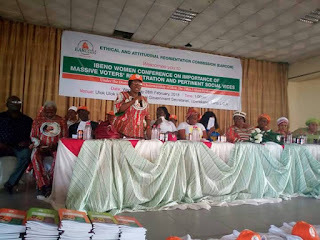 The programme which kicked off at Ulok Ulok Hall, Ibeno Council Secretariat, Ibeno Local Government Area had the chairman of the commission Dr Dorothy Thompson address the women on issues ranging from 'voters' registration, social/pertinent vices asking the women to be more concern on the activities of their wards as that is the only way they can curtail their excesses. She asked the women who are yet to register for their voter's card to do so as 2019 is the year to reelect Governor Udom Emmanuel for second term to continue delivering good governance to the people of Akwa Ibom State. Speaking at the occasion, the Chairman Of the Nigerian Youth Council Ibeno Chapter, Comr Samuel Akpan who represented the SA to the Governor on Youth Matters Comr Aniefiok Iwa Udofia advised the youths to shun all form of social vices and indulge in meaningful activities, he also advised them to go out and register and have their voter's card as that will be the only weapon to reelect Governor Udom Emmanuel come 2019. Dignitaries who spoke at the occasion emphasized on the need for the youths to see themselves as pillars of the society, advising them to shun cultism and other social vices and live a better life, register for voters card and be ready to reelect Governor Udom Emmanuel come 2019. High point of the occasion was the presentation of stickers, fliers, exercise books to support the free education programme of the Akwa Ibom State Government and other incentives to cement the campaign. 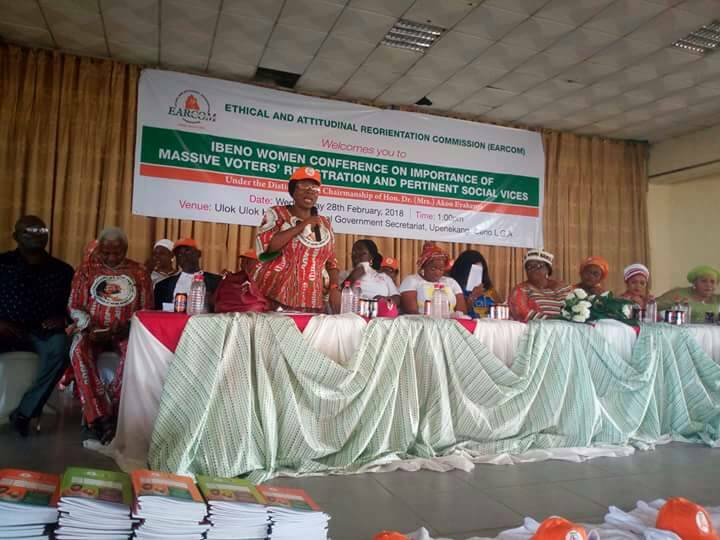 The Women of Ibeno surprisingly held their voter cards up to confirm their registration and readiness to vote Governor Udom Emmanuel in the up coming general election in 2019.